So, you’ve decided on the occasion. Perhaps you’ve set a date and chosen the venue. Of course, the food and beverages you cater will be key to the event’s success, your guests’ enjoyment …. and your satisfaction. To make the most of this opportunity, here’s how to prepare to meet with an event caterer. In fact, you’ll want to interview two, three or even more catering companies to determine if they’re a good fit for your upcoming event. What should you ask during your meeting? Can you handle the number of people we plan to invite? You’ll need to share your expected turn out with the event caterer or event planner. Do you regularly cater in our area? If they don’t often cater special events in your city or region, the catering company may have difficulty with the distances and timing involved. Someone who’s not familiar with your area may not be much help recommending other trustworthy local vendors like tent rental firms, bartenders or florists. Do you have experience at the venue we’ve chosen? While many locations are well equipped to handle catering companies, others are not. At certain venues, the event caterer will need to set up a kitchen or other food-serving facilities onsite. How do you describe your food? Do you have any specialties? What distinguishes your catering services from other event caterers? If you have special food items in mind for your event menu – and they’re not prepared to serve them – you’ll want to know as soon as possible. By the same token, you won’t want to miss out on a caterer’s crowd-pleasing, signature menu items! Can you provide references from satisfied customers? 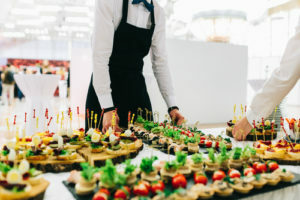 Whether you’re planning a catered company event, fundraiser or perhaps a catered outdoor wedding reception, you’ll want to pay special attention to the event planner’s reviews from similar affairs. Will your catered event proposal include all costs? Exclusions can affect your catering budget’s bottom line. It pays to ask this question up front to all potential catering companies.